Pacific Transcription receives consistent feedback that the number one issue concerning clients who access transcription services is the quality of service provided. How do we know? Because we ask our clients what they think about our service provision. 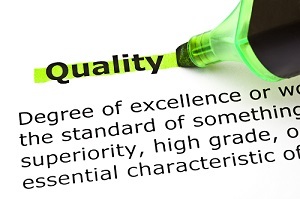 Quality of service has been identified as the number one issue concerning our clients. We have identified this through our quality management process. This process forms part of ISO 9001 standard, an internationally recognised standard for quality management. To achieve ISO 9001 certification businesses must submit to regular external audits by an independent body. These audits examine the quality management systems in place, and how they are created, monitored, measured and improved. If the business cannot provide evidence of the system at work, they fail the audit process. Delivering improved customer satisfaction through careful implementation of these processes. We use the word “client” rather than “customer” because we value the opportunity to foster a long term relationship with the people who use our services – our clients. What matters to our clients, matters to us. We genuinely care about what our clients think because it is only through monitoring, measuring and improving our service provision to our clients that we remain relevant to them. We personalise our transcription solutions to suit individual client needs. We do this by listening to our clients, and tailoring an appropriate suite of solutions for each client. We retain our clients by offering genuinely superior quality of service provision. So, what is the value proposition? Our value propositions are based on real deliverables that our clients value and return to, again and again. We report on our service. We are accountable to our clients, so they can be confident in the high quality service we provide. It’s that simple. For more information on how Pacific Transcription implements the ISO 9001 quality management standard and how clients reap the benefits, click here or contact Pacific Transcription.